Djibouti is in the midst of a port and rail spending spree estimated at over $12bn, and the US and France are not happy about it. The strategic fight over control of global shipping lines comes into sharp focus in the tiny Horn of Africa state, Nizar Manek of Bloomberg reports in a deep dive into Djibouti’s Chinese infrastructure lending. “About a third of all the world’s shipping steams past this barren land on the northeast edge of Africa en route to and from the Suez Canal, the Red Sea, and the Indian Ocean,” Manek writes. Djibouti’s spending on port and rail projects is estimated at over $12bn, while its GDP in 2017 was only $1.85bn – triggering warnings from the IMF over debt sustainability. But Djibouti’s finance minister Ilyas Moussa Dawaleh, who has just returned from Beijing where he sought to restructure Chinese loans, says Djiboutian state enterprises should not be included in the IMF’s assessment because they “are overperforming or have the capacity to overperform”. “Bolton warned of the consequences if, as has been rumoured, China Merchants were to gain control of the Doraleh Container Terminal via a debt-for-equity swap. ‘Should this occur,’ he said, ‘the balance of power in the Horn of Africa – astride major arteries of maritime trade between Europe, the Middle East, and South Asia – would shift in favour of China,’” Manek reports. Even French President Emmanuel Macron is getting in on the act. 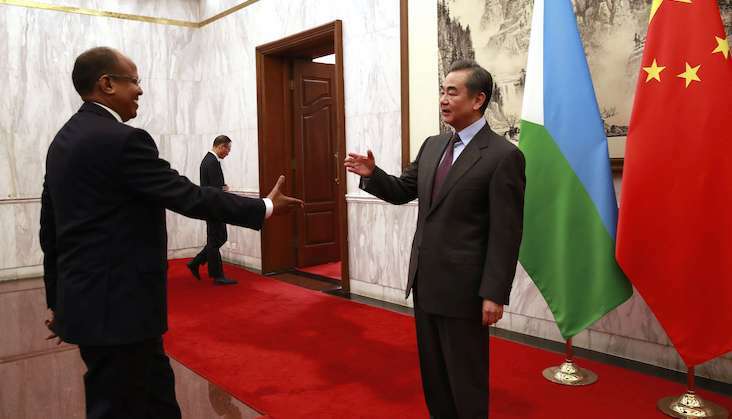 The US, France, Japan, Italy, Spain and soon Saudi Arabia all have a military foothold in Djibouti, but they can rail as much as they like: the Chinese remain the friends with the deepest pockets.